It was determined that our Cloudsorba suspended acoustic panels would be the best option for this due to the limited amount of wall space. 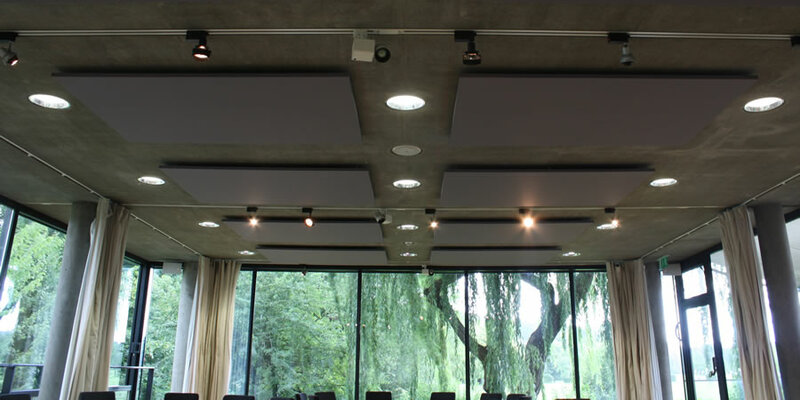 Cloudsorba are a Class A acoustic panel, which is the highest classification available. These panels can be made in custom sizes up to 2.7 x 1.2m, which allowed them to fit between the light fittings and pre-existing services. Our wide range of 72 standard colours allowed for the perfect colour to be chosen to both blend in and complement the current ceiling. Our short lead times meant that the products could be delivered to site within a week. The simple installation methods made for a stress free experience when fitting the panels. Overall the Rowing Museum was very happy with the panels and how well they solved the acoustic issue they were having.